Site Meter, a favorite website counter and statistics tracker for blogging community has started to track outgoing clicks, in what Site Meter dubbed as outbound clicks. Outbound click, also called exit link, exit click or outgoing click, is a link on your website or blog that your visitors click to leave your site. The exit link tracking can tells you where your visitors go after leaving your website or blog, and tells you which links on your site that most likely to take your visitors away. You can describe it as outbound traffic. 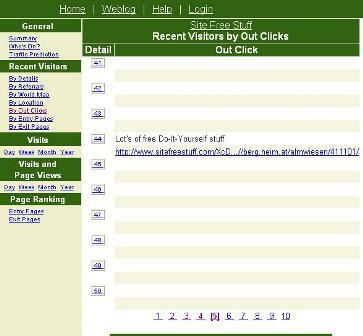 Site Meter will track and show you the outbound links that your last 100 visitors click on. If the visitor didn’t click on any outgoing links, then the visitor’s slot will appears blank. The click statistics of Site Meter seem visitor-centric, so if a visitor clicked on a few outgoing exit links, only the last one will be captured. And, Site Meter stated that the out click can occur any time during the visit and is not necessarily a click on the exit page of the visit. Check out more at http://www.sitemeter.com/. Most professional web analytic and web statistics software is able to track outbound exit clicks. However, the feature is hard to find in free trackers available. Of those available, MyBlogLog (acquired by Yahoo) is a pretty reliable and good service, although free version is not real-time, where you can only view up to previous day data, and the statistics will only be kept for a weeks, and only top 10 links are shown.